Scuba gear packages are great for beginners. With a scuba package, you get almost everything you need to start diving. 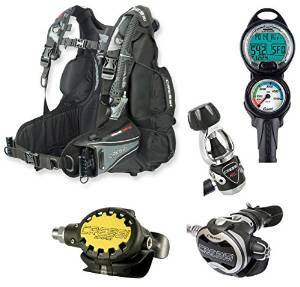 Typical packages include a regulator, octopus, buoyancy control device (BCD), basic diving computer, and other hoses and attachments a diver would need. More advanced and expensive gear packages can include fins, snorkels, masks, and other scuba accessories one might need to start diving. There are innumerable scuba gear packages out there, and some local dive shops even offer their own packages. When choosing a package, it is important to keep in mind the different locations you plan on diving. Different packages are usually designed for diving in a particular environment. As with choosing any scuba equipment, it is always important to consult with a professional before making a purchase and diving with that equipment. However, if you are are a beginning scuba diver, or have been diving with rented equipment and would like to own scuba gear for yourself, a scuba package is a great option!